There’s been a lot of hoopla about Apple’s latest event. I’ve blogged on it and a good summary of lots of opinions about the topic can be found here: http://mjtsai.com/blog/2016/10/27/new-macbook-pros-and-the-state-of-the-mac/. This post is more of an introspective piece about me, so fair warning. I’m what you’d probably call a mid-time Mac user. I used Macs growing up in school and learned my first “real” programming language on one during school (Pascal). However, I didn’t actually start owning Macs until the Intel transition. At the time, I was fairly deep in the Windows platform. 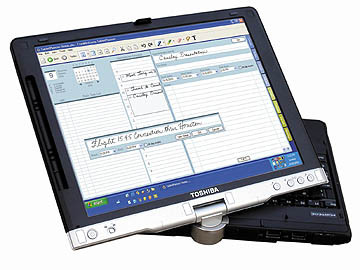 My first computer that I had purchased (my actual first computer was a Packard Bell, 486 25MHz machine) with my own money was one of the first convertible laptops that Microsoft helped usher out: the Toshiba Protégé 3500. Mind you, this was like back in 2003. Pen computing was new (at least in the consumer space), and it was going to be huge. Well… or so I thought. Turns out, the novelty wore off pretty quickly. The hardware and the software just wasn’t very compelling. The truth is, even over the years, there’s not been a single Windows PC that has ink that really felt much different than that Toshiba. I had been eyeing the Mac for some time. I’d even used one of the old white plastic iBooks that a friend lent to me to help on a project. I was pretty turned off because I thought the hype of Mac OS was supposed to be better than this! It turns out, those iBooks were just pretty terrible machines. Their touch pads sucked and they were missing a bunch of the features that their bigger brothers, the PowerBook had. Now, I wanted a PowerBook, but I simply wasn’t able to give up running Windows. Also, as a freshly out-of-college graduate, I certainly didn’t have the money to buy both a PC and a Mac, even though I did just land a job at Microsoft (which I still work at today, for full disclosure). It turns out living in Kirkland is pretty expensive. Over the next 12-18 months, I would transition over to Mac OS X for all of my home use. Eventually, the Windows Boot Camp partition would be gone. It’s hard to explain exactly, but there was just something so refreshing and so emotionally engaging about OS X. I know that doesn’t exist for everyone, but for me, it was a huge pull. It’s why I still use a Mac today. It’s why even after using Win 10 with all its improvements (and sadly the only real vessel for playing games), switching back to my Mac just feels like home. Over the years I’ve got to see the Mac flourish, OS X make great improvements, the iPhone, and the iPad. It was a really great time to be an Apple enthusiast. It seems like every product that came out was, “YES, I WANT! DONE!”. And then the “big” iPhones starting coming out. And then the WATCH came out. It’s kind of ironic as this was near the end of the time that Apple was making fun of fragmentation in the Android market, and well, here we are with fragmentation of a different sort now: form factors and platform variations. But for me, this was also the first time since 2006 in which I didn’t want to buy what Apple was creating. Side Note: I have an WATCH series 2 now, and my quick review would be: it’s ok. I set my expectations low going in as I only wanted it as a watch and a fitness tracker. It has reminded me how much I miss wearing a watch though. No big deal right? More consumers in the space now, more needs and compromises to be made. Yeah? Maybe. But the cracks were already showing with each software update adding new features and not fixing bugs – some of which that have been around for years now, like the incomplete progress bar – ok, an exaggeration, they were fixing some of the bugs. But there was a lot of stuff that was just not working well or at all (Maps, iCloud, and MUSIC as examples). Sure, some of this has gotten better, but some not, and some has just changed to a new kind of pain. Then we got the PENCIL. I went to the Apple store to use one, it felt great! Remember that Protégé from above? Nothing like that. This was smooth, almost no latency, awesome. I have an iPad Pro. How often do I use the PENCIL? Honestly cannot tell you the last time. Frankly, how much do I use my iPad Pro? Remember all those Apple jokes about a giant phone app on an Android tablet? Yeah… say hello to iPad apps on an iPad Pro. We also got Swift. The “Objective-C without the C” language. Now Swift has a lot of nice features in it, but it’s a pain to use right now. The tooling (namely Xcode and the debugger) is really terrible, it’s extremely unstable from version to version. It has huge discrepancies between optimized and non-optimized builds in terms for performance, and in some cases, functionality (though I think nearly all of those are fixed now). I could go on, but the point is, Swift is not really the language for me at the moment (nor is necessarily the direction I’d hoped for, but maybe I’ll reflect on that more later). That will definitely change when things settle down, but it’s not there yet, including some of its broader cross-platform implications. Luckily there is the event, “hello again”, right? Let’s start with TV. Besides the obvious “TV in a TV” jokes because of the questionably lazy design of the app icon… wasn’t is just last year that Cook said, “We believe the future of TV is apps”? And now, you’re going to shove all of this “content” into a single location… well, not all of it as TV is still missing Amazon Prime and the new app doesn’t include Netflix. This covers the rest better than I care too: http://joe-steel.com/2016-10-28-Apples-October-TV-Surprise.html. Why not the Nvidia 1060 and 1080 chips? Why not sacrifice some thinness gains for more power or more battery life? Why not the 7th generation Intel chips? Why not more than 16GB of RAM? After reflecting about it some more, I think the answer is simply: because Apple can. Every update to the MacBook and MacBook Pro have been wrought with various trade-offs. Sometimes we mock the choices, but even in my poking, I’m glad there is a company that is trying to push just how thin can we get a computing device. I don’t think Apple is willing to stop until it’s paper thin. Sometimes it’s really disheartening looking out at the PC landscape of hardware and seeing all of these options that make different sets of trade-offs. Maybe those trade-offs align with more of what I’d like personally, which make it even more troublesome. Do I really want to buy a new PC? Is that where I want to move to? I mean, I play games on a PC, but I’m reserved to that fact already that Mac has just lost the battle there as is unable to recoup. Now, the MacBook Pro is not everything I want in a laptop. It is most certainly not everything that I want in a desktop computer. But, when the dust settles, it’s still a Mac. With all of the warts that macOS has, with all of the mind boggling decisions that Apple makes with some of their products at time, is there really any other platform I’d rather be using? No. The answer is that I do not want to. Even with many things at Apple seemingly going a direction that I might not like, I still have hope that Apple can start to tighten the reins in (if the rumors of project Titan being cancelled or scaled way back are true, I think that may be a good indication that some retraction is indeed starting). And who knows… maybe the Mac Pro will get updated in March. Maybe Apple is on a three year cycle with it because it thinks that’s roughly the upgrade cycle of desktop Mac users. I don’t know… but I do know that I cannot risk waiting until then only to be potentially severely disappointed by a lack of announcement. But, if this it the slow, twisted demise of macOS, then I guess I’m going to ride it down to the ground.